Buying British Pound in India Made Easy! Why Buy British Pound via ExTravelMoney? GBP rates can fluctuate dramatically. With Extravelmoney, you can observe and lock the rate when it is favorable. Just pay a small fully refundable rate lock fee & lock the rate for as much as 3 days. The British Pound Sterling is the official currency of the United Kingdom and many other territories. The British Pounds is one of the oldest currencies in the world that still exists. The British Pound is represented by the symbol £ and by the ISO code GBP. One Pound is subdivided into 100 Pence. The Sterling Pound banknotes and coins are issued by the Bank of England. The banknotes issued ranges from £1 to £50 and coins issued ranges from 1p to 50p and £1 to £5. Similar to USD the British Pounds is also one of the most traded currency in the world. Since the Pound Sterling is the official currency in a lot of territories and countries other than Britain, the currency has a global value. 1. How much money can you take to the UK from India? A resident Indian is allowed to carry up to a maximum of USD 3,000 (approximately Rs 2,11,935 as per today’s US dollar rate in India) or its equivalent in any other currency (British Pound - 2,320 GBP) as cash and a total of USD 2,50,000 (approximately Rs 1,76,56,250) or its equivalent in other currencies in a single financial year in the form of forex card and cash. 2. How to exchange Indian rupee for British Pound in India? Exchanging Indian Rupee for British Pound in India is very simple. It can be done in almost any town or city in India. You can go to your bank where you hold an account and buy British Pound from them by exchanging it for Indian Rupee. Otherwise, you can directly approach a money changer store near you and do the same with them. There are many money changer stores that offer good rates for British Pound. You can use extravelmoney.com’s online forex platform to compare the exchange rates offered by different forex stores in your town or city and make an informed choice. 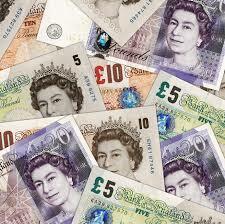 Buy British Dollars online from the money changer offering the best rate. Lock the exchange rate, place the order online and get British Pound delivered to your home. 3. Can we convert Indian Rupee to British Pound in England? The Indian rupee is a restricted currency. Its flow outside India is strictly regulated by RBI. Thus, you wouldn’t be able to find a legitimate bank or money exchange agent in England who can exchange your Indian rupee to British Pounds. There might be someone willing to take in your Indian rupee and give you British Pounds but high chances that it is a shady establishment and best to be avoided. Instead, we recommend you to buy British Pounds before going on your trip. Exchange Indian rupee to British Pounds in India from your bank or from an RBI authorized money changer. 4. How can we exchange leftover British Pound currency in India? When you are having leftover British Pounds after coming back from your trip abroad, you can sell it to banks or money changers in India. ExTravelMoney helps you sell foreign currency online in India. Locate money changers near you through our portal. Compare the exchange they offer for British Pounds and choose the best forex store. 5. Is Euro accepted in UK? Even before Brexit happened, the Euro was not used in England for payments. Some shops and hotels may accept them as a courtesy to customers but the exchange rate they offer will be unfavourable. It is better to convert your Indian Rupee to Pound Sterling before going to England. 6. How much Indian Rupee can we take to England? Resident Indians are allowed to take up to INR 25,000 as cash on their trip abroad. 7. Which is the best forex card to take to UK? Different banks and money changers provide forex cards with many advantages. Some may have no activation fees, some may have no ATM use abroad fees etc. To choose the best forex card for UK, compare the various cards offered by banks and forex centers in India through Extravelmoney. Select a bank or money changer offering forex card at the best exchange rate and book your card online itself. 8. What is the best way to carry money to England? The best way to carry money to England would be to use a combination of cash, forex card and debit/credit cards. Calculate the total rough expense required for your trip to England (including emergency funds). Carry about 40% of this total in British Pound currency as cash. Load the rest 60% in prepaid forex travel card. Don’t forget to carry your international credit/debit card as backup money. 9. What are the documents required for buying British Pound in India? 2. A confirmed air ticket showing travel within 60 days from the date of buying British Pound. 10. What are the denominations of British Pound currency in circulation? 100 pence equals 1 pound.